With all the different options, government regulations, and QuickBooks software packages, picking the right W2 form can be difficult. This page will break down everything you need to know to purchase the correct forms for your business and prepare your employees for tax time. 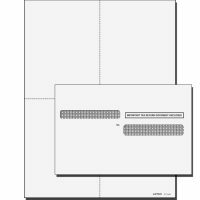 Would you rather work with a person to figure out the right W2 tax form kit to purchase? Call us at (800) 216-0763 and talk to one of our expert advisors to determine the right kit for you. Which W2 forms are right for your business? The type of W2 tax form you need depends on your employee’s residences and the state/city laws that govern taxes there. Feel free to call us at 800-216-0763 and speak with our experts to help you determine which kit you should purchase. We would be happy to help. For those using the QuickBooks Desktop Enhanced payroll, you have a choice of preprinted forms or blank forms. It does not matter to the Social Security Administration, some employers purchase the preprinted to save on the cost of printer toner and because they feel the forms look more official. 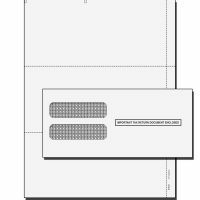 The blank forms must be printed on special perforated paper which we sell along with the envelopes. 4-part W2 tax forms are for employees that live in states that do not have state income tax. 6-part W2 tax forms are for employees that live in states that do have state income tax. 8-part W2 tax forms are for employees that live in cities that do have city income tax. We have provided the following table to help you figure out which W2 tax form kit is necessary for your state. For use with QuickBooks Enhanced Payroll. AK, AR, AZ, CA, CO, CT, DC, DE, FL, GA, HI, IA, ID, IL, IN, KY, LA, MD, ME, MA, MN, MS, MT, NC, ND, NE, NH, NJ, NM, NV, OK, OR, SC, SD, TN, TX, UT, VA, VT, WA, WI, WV, or WY. For use with QuickBooks Online. Orders under 100 forms shipped priority mail (delivers to most locations within 2-3 days). Otherwise, orders over 100 forms are shipped UPS. Need it faster? Call in and ask about expedited services. Call now at 800-216-0763, if you prefer to talk to one of our Advisors, to determine which kit is best for you. All W2 tax form kits are dated material and, therefore, non-returnable. Our QuickBooks W2 Tax Form Kits work with QuickBooks Desktop Pro/Premier/Enterprise, QuickBooks Online and QuickBooks Mac for years 2018, 2017, 2016, 2015. 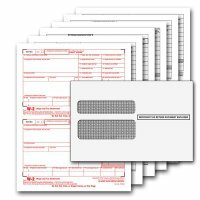 When you order your W2 forms kits from QBalance, your tax forms are QuickBooks compatible and IRS approved. QuickBooks W2 Tax Forms work with any laser or ink jet printer. Get your free W2 Guide when you purchase your QuickBooks W2 Tax Form Kit. Our free guide gives step by step instructions on everything you need to know on completing your W2s. If using QuickBooks Assisted Payroll please call 800-216-0763 for more information on the W2 tax forms you will need. 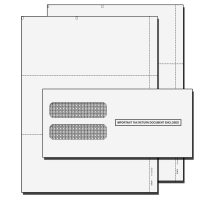 Preprinted tax forms – these forms have the W2 tax form already printed on the page. 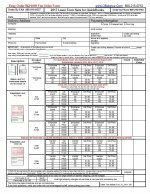 Two forms to a sheet and QuickBooks only needs to print inside the various cells. When ordering, order for the number of employees that will need a W2 tax form. Copy B – To be sent to the employee and filed by the employee with the employee’s federal income tax returns. Copy C – To be sent to the employee, to be retained by the employee for the employee’s records. Copy 1 – To be filed with the employee’s city income tax returns (if any). Copy 2 – To be filed with the employee’s city income tax returns (if any). Why buy your QuickBooks W2 Tax Form Kit from QBalance.com? You will be taken step by step on end of year processing of your W2 tax forms when you receive our W2 tax form guide. Our instructions include useful information such as a federal W2 Checklist that will help you reconcile that your W2’s agree to your 941 forms filed, state W2 checklist for those businesses that have state income tax withheld from paychecks, W4 assistant for help in determining how many exemptions to claim, IRS instructions on when and where to file W2s with the Social Security Administration and step by step instructions to preparing and printing your W2 tax forms in QuickBooks, If you still need someone on one help with this process, call us to learn about our support pricing and schedule a support appointment to have one of our QuickBooks Pro Advisors work with you. A W2 tax form is an Internal Revenue Service tax form used here in the United States. Employers use these W2 tax forms to report an employee’s paid wages and also, the taxes withheld from those wages. An employer must complete a W2 form at year end for every employee that includes all salary, wages or other compensation that were paid to the employee. 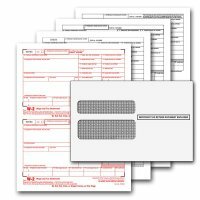 The employee gets copies of these W2 tax forms to submit to the IRS and for some to their state when filing their income taxes by April 15th. Every employer is required to either hand deliver or send via US postal mail their employees W2 tax forms by the deadline of January 31st. Please send these timely. There are penalties for being late. This gives the employees time to complete and turn in their income tax returns. Each employer, at the same time, must send to the Social Security Administration a W3 Transmittal form with a copy of the W2 tax form for each employee. If the employer has 250 or more employees, then he must file electronically. To get more information, go to the IRS website and search for “Who must file Information returns electronically”. Learn about common end of the year tasks for employers.